Wood floors are beautiful and durable, adding warmth and personality to a room in a way that no other type of flooring can. Each plank tells a story by displaying the history of the tree from which it was cut. Unlike carpeting, which traps dust, wood flooring is non-allergenic and easy to maintain, making it an ideal choice for the whole family. We’re fortunate that New England has some of the finest timber in the world, with superb grain and color, thanks in part to the region’s combination of climate, geography and native species. Sourcing this fine timber from woodlots close to our mill in Massachusetts, and from loggers across New Hampshire and Vermont, enables us to provide customers with wood of superior quality and character, while supporting the local economy in these areas. 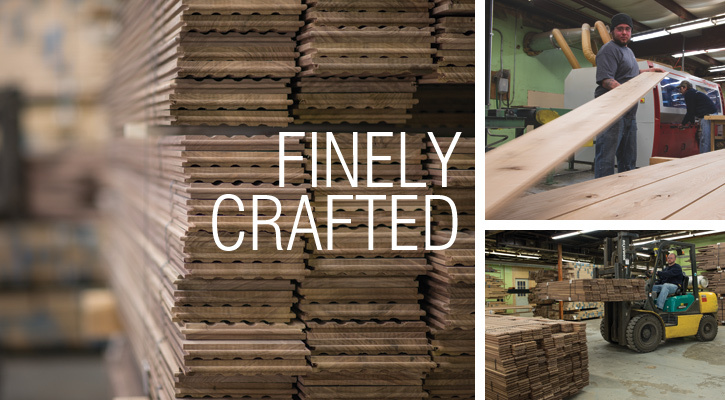 Beginning with responsibly-harvested trees, we specialize in wide planks sawn at local mills. With our flooring line, you can choose from a wide range of species—from northern oaks to southern hardwoods, and beautiful native pines to numerous exotic species. We use state-of-the-art machinery, hand-grading and tailoring each board to your specifications. Board width is one important element in making a design statement. At Ponders Hollow, while we can mill your boards in whatever width you choose, we specialize in wide plank floors. Wide plank floors have been a New England tradition since the Colonial days, when mature old growth forests provided trees of exceptional size; and each plank was used the way it was sawn from the timber. Wide planks, then as now, showcase the wood’s true nature and history. Our experienced flooring and milling specialists will help you create the design of your dreams and will guide you through the process, from wood selection to finished floor. Consider using our millwork in a different species to call attention to the architectural details of your room. You can also utilize the same wood for a seamless, harmonious look, or choose painted wood for a crisp contrast. Download our Hardwood Flooring Installation & Maintenance Guide.